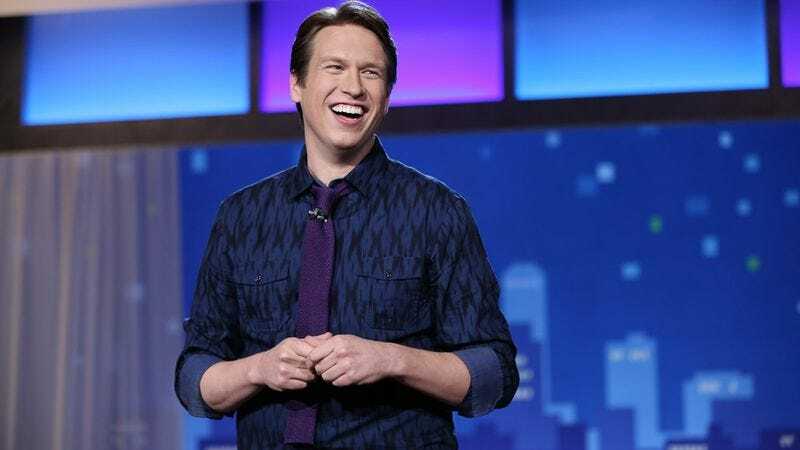 Deadline reports that HBO has ordered a comedy pilot directed by Judd Apatow about the real-life experiences of comedian Pete Holmes (American Dad! ), who slept on other New York City comedians’ couches after his wife left him. The semi-autobiographical Crashing is written by and will star Holmes, who on his podcast You Made It Weird has credited comedian John Mulaney with helping him weather a divorce. This will be Apatow’s first time directing a TV pilot. He will also serve as an executive producer, a role he already fills for HBO’s Girls. You can see the appeal of a show that simultaneously offers the serialized journey of a man rebuilding his life and also the procedural aspect of having a new guest-starring comedian each week. Viewers presumably can look forward to a roll call of New York’s funniest people, with the likes of of Amy Schumer, Lewis Black, and Fred Armisen potentially offering their cushions to soothe Holmes’ anguish. This, of course, should lead to a season finale where Holmes stays with Louis C.K., whose daughters are concurrently having a slumber party. For a glimpse at the chemistry between Apatow and Holmes, watch the clip below from the late Pete Holmes Show. In it, Holmes pitches Apatow a movie based on his divorce that Apatow rejects because it sounds “tragic and sad,” which of course is the seed of any successful TV show.